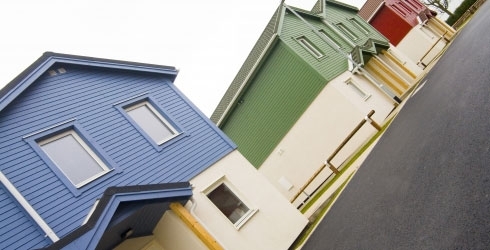 This innovative project involved the use of a highly energy efficient Swedish timber frame system for four 3 bedroom and eight 2 bedroom semi-detached homes. Achieving Code for Sustainable Homes Level 3 the project has been a success for all parties involved. The project not only showcases some of the best eco-friendly build technology available, it is also a testament to successful partnering and open book negotiations. Working closely with the client, Lincolnshire Rural Housing Association, and the contract administrator, Andrew Marston Associates; Woodheads have completed a project that emphasises the benefit of all parties committing to a Partnering Charter. Air Management: highly insulated walls, floors and ceilings with triple glazed windows created a very tight structure with minimal amount of heating required. Solar Heating: solar panels were installed for hot water heating further improving energy efficiency and reducing the carbon footprint.